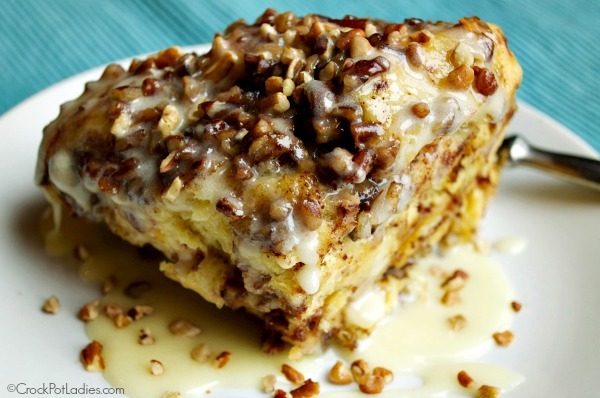 This easy recipe was a huge hit with my family when I made it for brunch one Sunday morning. 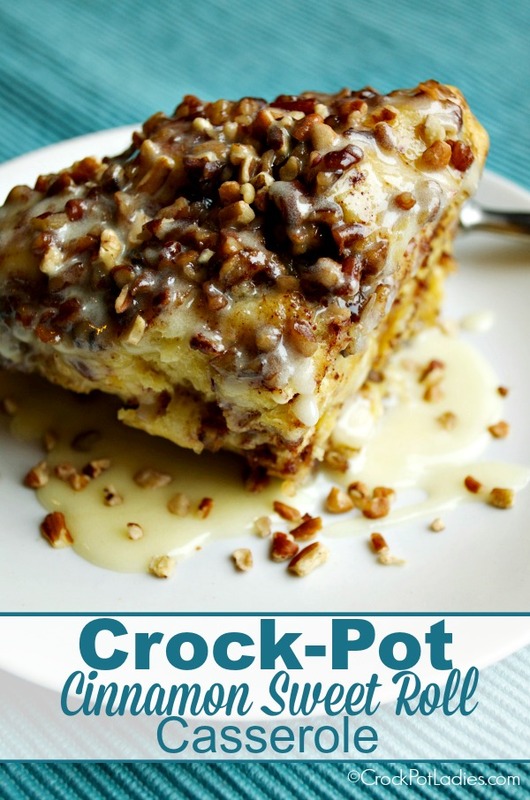 Because it uses refrigerated cinnamon rolls it comes together super quick in your slow cooker. The cinnamon roll dough is cut into bite sized pieces, much like you would for a monkey bread, and then a custard is created with eggs, milk, cinnamon and vanilla. 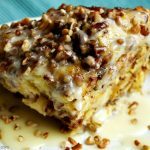 Then, to take this recipe over the top, chopped pecans are added on top to give everything a lovey crunch. You just cook this casserole for about 1 1/2 to 2 hours until the dough is done. We served this sweet roll casserole with scrambled eggs, cooked bacon and sausage and delicious orange juice for a brunch that was memorable and yummy. Line the bottom of the crock-pot with foil for easy removal or use a heat safe casserole dish that fits in your crock-pot. Melt butter in the microwave or on the stove-top and poor into bottom of a 6 quart crock-pot. Open your refrigerated sweet rolls and set the Icing aside for later. Cut each sweet roll into 4 equal pieces. In a bowl beat the eggs, milk, cinnamon and vanilla extract. Poor the egg mixture over the sweet roll pieces in the crock-pot. Cover and cook on HIGH for 1 hour 30 minutes to 2 hours or until the middle is no longer doughy and springs back to the touch. Heat your icing containers in the microwave for 15 seconds (might have to do twice), but be careful so you do not melt the containers. Pour the icing over the sweet rolls. Do you have to line the bottom of your crockpot? Sounds wonderful. Will try it. BTW “pour” is what you meant I think, because poor means “having little money or worldly goods”. Boo… I hate when people are spelling/grammar Nazis, when someone is doing a wonderful service for FREE. BTW, stove calling kettle black, because you are missing a comma. On another note… Crock-Pot Ladies, I’m going to try this one! When you ask for an 8 ct. of refrig. cinnamon rolls, do you mean like the pillsbury ones? Or do they have to be baked already? So already in bread form??? Thanks! Refrigerated Pillsbury Type ones. The ones that are not cooked yet. How does the egg mixture combine with the dough of refrigerated rolls?? It does not really combine. But the eggs cook in and around the rolls. Similar to any of the other egg/milk casseroles.